Nineteenth-century France saw the revival of an interest in eighteenth-century culture and style, and one that extended to both literary and visual artists. The versatile artist-author brothers, Edmond and Jules de Goncourt, were instrumental figures in popularizing eighteenth-century themes and scenes with texts that offered glimpses into a previous century with Portraits Intimes du Dix-Huitième Siècle (1857-58), biographies of fascinating personages with Histoire de Marie-Antoinette (1858), and a revival of the capricious nature of Baroque and Rococo art with L’Art du Dix-Huitième Siècle (1859, with several subsequent editions). Learned dilettantes and the public alike grew increasingly interested in recalling the past pleasures of the French monarchical and Republic periods, solidified by artists who presented them with a wide range of visual images – from anecdotal genre scenes to historical iconography rendered with the most intricate detailing. 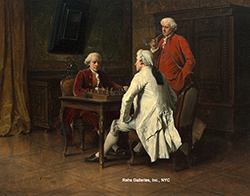 While perhaps the most well-known artist working in this vein was Ernest Meissonier, it was the many other artists, such as Eugène Fichel, who, together, created an association of artists who brought to life these eighteenth-century episodes. It was Fichel, however, who was considered “the cleverest painter in the newest school of French genre,” (“The Encyclopedists,” The Atlantic Monthly, Vol. 21, Issue 124, February, 1868, pg. 246) and one who treated his paintings “with spirit, with the dexterity of a prodigious hand.” (Ernest Chesneau, L’Art et Les Artistes Modernes en France, Paris: Didier et Cie, 1864, pg. 224). B. Eugène Fichel was born on August 30th, 1826 in Paris. A talented young artist, he entered the École des Beaux-Arts at the young age of fifteen, where he eventually became a student of Martin Drolling and Paul Delaroche, the latter a winner of the Prix de Rome and whom he would most consistently cite as his master. Given his very young age and the rigorous training necessary as a student of the École des Beaux-Arts, Fichel did not exhibit his first painting until the 1849 Parisian Salon, where he showed Sainte Famille (Holy Family), Portrait de Hadji-Add-Hamid-Bey (Portrait of Hadji-Add-Hamid-Bey), and Portrait de M.L. (Portrait of M.L.). Fichel became a prolific Salon artist, beginning with many portraits, but later exhibiting, consistently and unwaveringly, historical and genre scenes inspired by the eighteenth century. Fichel chose to submit many historically-oriented works to the Salon, at that point considered the most elevated subject matter, such as his 1867 Salon entry “Ouvrez au Nom du Roi” (“Open in the Name of the King”). As his Salon career progressed, Fichel began submitting more often the types of intimate genre scenes influenced by Dutch painting, such as his 1883 Joueurs des Cartes (Card Players) and his 1888 Le Dejeuner (The Luncheon). Effect of this composition is imposing ; the severity of coloring is well in harmony with the calm that reigns in the study where the great captain contemplates in silence the plan of a new campaign and of new victories, while further away his secretary is absorbed in the expedition of numerous dispatches. Everything in this canvas is rendered with a care and a talent that leaves nothing to be desired. 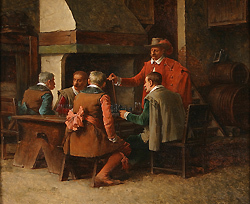 While critics took notice of Fichel’s contributions to the annual Salons, it was Fichel’s similarities to another artist of high stature, Ernest Meissonier, that drew the majority of the comparisons. Since Meissonier was considered by some to be “the first French artist to become celebrated in miniature genre,” and “the most conspicuous artist of the entire French school,” (C.H. Stranahan, A History of French Paintings, New York: Scribner’s & Sons, 1888, pg. 335), it is natural that many later artists with similar stylistic propensities would fall under the banner of the “school” of this master. Many contemporary accounts of Fichel’s work do not concentrate exclusively on Fichel’s production, but more so at his relation to the work of this artist. The two men often treated very similar themes, notably the artist in his studio, a prominent inclusion in both artists’ production, in addition to historical scenes, each looking back to the eighteenth-century historical and genre scenes. Nevertheless, being loosely linked to a school of artists who possessed a “great felicity of detail,” (“The Editor’s Chair,” Harper’s New Monthly Magazine, Vol. 30, Issue 180, May 1865, pg. 810), did provide Fichel with added exposure and the benefit of a relationship with a growing number of other artists treating similar subjects. During his career at the Parisian Salon, Fichel was awarded several awards and continued to exhibit there until his death in 1895. He was awarded a third class medal in 1857 for Une Matinée Dramatique (A Dramatic Morning), a portrait painting, and two other works; a mention in 1861 for several works including La Première Leçon d’Armes (The First Weapon Lesson), Chanteurs Ambulants Dans un Cabaret (Traveling Singers in a Cabaret), and Baptême de Mlle Clairon (Baptism of Mlle Clairon); a medal in 1869 for La Nuit de 24 août 1572, avant les massacres (The Night of August 24th, 1572, before the massacres), and Le Fou qui Vend la Sagesse (The Insane who sells Wisdom) – based on a fable by La Fontaine; and a silver medal at the 1889 Exposition Universelle. He finalized his exhibition career with Au Café (At the Café) and Partie des Dames (Ladies’ Departure). Fichel achieved one of his highest honors in 1870 when he was named a Knight of the Legion of Honor. At the end of his career he had achieved, “an envied place among the genre painters of the French school of the nineteenth century.” (Zafran, 42). He died in 1895 in Paris. 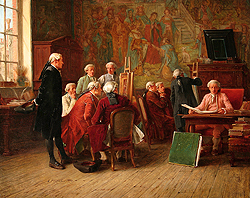 Fichel’s work is a reflection of many of the values in academic art of the nineteenth-century: reliance on the tutelage received at the École des Beaux-Arts, adherence to the principles of flawless execution, treatment of varied historical themes, and an interest in both eighteenth-century themes and those reminiscent of Dutch masters – found in both historical and genre scenes. 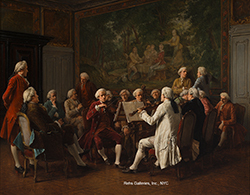 Though often overshadowed by Meissonier, Fichel’s accuracy of detail, love for rich colors, and interest in perpetuating an interest in the eighteenth-century deserves merit outside of his relationship to other artists of his period. Fichel’s work can be found in many of France’s museums, including the Musée Magnin and the Musée des Beaux-Arts in Dijon, and the Musées des Beaux-Arts in the cities of Lille, Rennes, Rouen, and Bordeaux.